Please include your name, phone number, and a time when you can be reached in your message. * Please note: Fictional scripts written by me, and copyrighted material under my name, as examples of my copy writing skills. All other recordings and scripts used here are copyright of their owners and used here with permission. Are you looking for a versatile, American-english voice, free of regional accents; for commercials, tags, video games or online training? Then look no further. 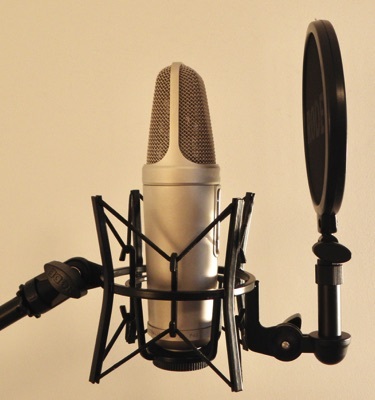 Having done on- and off-camera work for several large corporations such as Johnson & Johnson, and M&M/Mars; as well as radio ads, video games, online training, and a museum tour, I can provide you with a voice that will grab your target audience’s attention. Are you working on a script and need some help with ideas? I have over 25 years of experience in the corporate world, with much of it in developing courses, classroom training delivery, and project presentations. Just the experience to help you “wordsmith” that script you’ve been working on to give it the positive impact you’re looking for. Check out my reels/demos, for examples of some of my scripts. And look for me on IMDb.com. I look forward to working with you on your next project. • how quickly you need turnaround. My rates include two re-takes for minor issues (e.g., pronunciation, grammar, or vocal issues), or for minor revisions to the initial script, at no extra charge. Major revisions, additional scripts, additional revisions after script approval or the final recording has been submitted, will be charged at my hourly rate. I can provide recordings in the most common formats (.mp3, .wav, and .aiff). If you'd like to explore the rates for your project (I am always open to negotiation), please contact me.